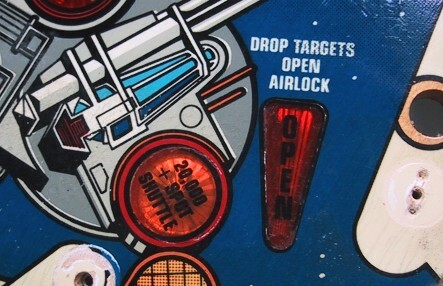 This page is devoted to that fun subject of removing Mylar from a pinball playfield. Its not an easy task, but done correctly can breath new life into a playfield with minimal dollar investment. I've done several with great results. The method I use to remove the Mylar involves dissolving the adhesive with a solvent and then removing it (the "Goo-Gone" method). If you're interesting in using the heat method of removing your Mylar, check out the posts of rec.games.pinball for other sites that describe this method. Want to skip my discussion on why Mylar is used and when you should remove it? You can jump right to the "Tools of the Trade" section. Update - I recently read on the pinball newsgroup (recs.games.pinball) about a Mylar removal method utilizing "freeze spray", the component cooling spray used to track down heat related problems. The poster claimed that by spraying the Mylar, you would "freeze" the Mylar itself and remove its bond with the glue. Sounded great in theory. I bought a couple of cans (I needed a can for its original purpose, so I sprang for a second can). I tried it on my Blackout where I needed to remove the Mylar from around the slings and pop bumpers. After unloading almost an entire can (6$ worth!) of spray, I managed to get one sling removed with an extremely large amount of paint coming with it. The pop bumper Mylars didn't budge! Freeze Spray may work on newer machines, but don't try it on any of your early 80's machines! "The leading polyester film and popular laminating substrate for flexible packaging structures, Mylar® combines easy machinability, strength, high- and low-temperature resistance, crystal clarity, and printability. Plain or metallized, formable, heat-shrinkable and/or coated for barrier, printing or sealing -- tough, beautiful Mylar® polyester films offer an outstanding barrier to gas and water vapor, with excellent flex and puncture resistance." Why is it used in Pinball Games? 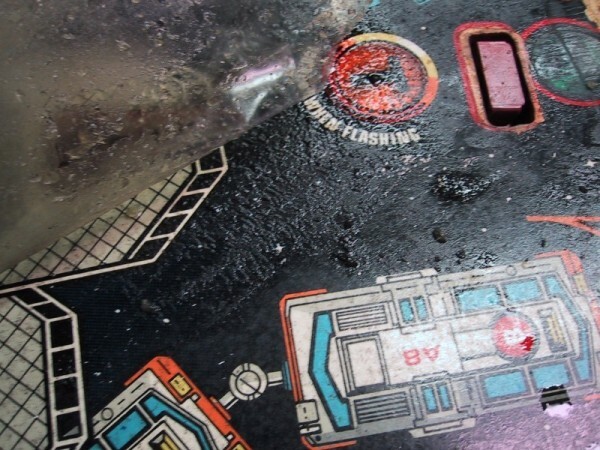 When a pinball playfield starts to get dirty, the force of a steel ball rolling over the dirt acts like sandpaper and starts wearing at the paint. The first sign of wear are those annoying "ball swirl" marks in the paint. This is fine dirt ground down into the playfield. As time wears on (pun intended..), this sandpaper type action will wear down the paint until there are bare wood spots on the playfield. Note how the playfield has been worn down to bare wood right in front of the kicker. 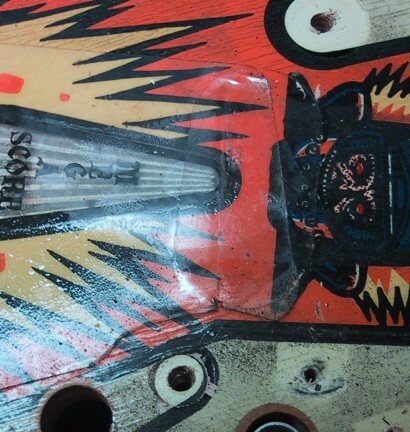 As you can see just from the two examples above, a pinball playfield can experience a lot of wear! Before the advent of Solid State machines (late 1970s), pinball games just weren't as fast as they are today. Slower rolling balls wore down playfields at a much slower rate. In the 1980's speed was the name of the game in pinball design, with the ball accelerating faster with every new release. This faster ball speed quickly speed up the wear and tear on playfields. Up to the 1980's, if an operator kept their games clean and waxed, playfield wear could be kept to a minimum. This didn't work as well on the early SS games, and playfield wear was accelerated. Look at most any early SS game and you'll see signs of extreme playfield wear. The Gorgar game above (1979) is typical of the wear on early SS games. 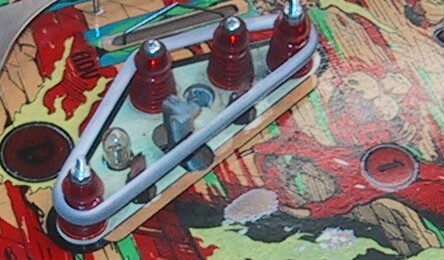 Pinball manufacturers had been using some sort of plastic playfield protection around pop bumpers for years (the area on a playfield that receives the most abuse). Early plastic rings did not have any adhesive on them, they just sat on the playfield. Soon Mylar with an adhesive starting replacing the "floating" pop bumper rings and manufacturers started using it in areas like the kickers and eject holes. Since not all operators wanted Mylar on their games, it was usually provided in a separate envelope to be applied by the operator when they set up the game. The original owner of the Gorgar above obviously didn't want to use the Mylar! Mylar was the best choice at the time for playfield protection. It was crystal clear and virtually indestructible. It could double or triple the life of a playfield. In the early 1980's, the manufacturers usually just provided Mylar for the kickers and eject holes. The rest of the playfield went unprotected. Aftermarket suppliers soon jumped in and produced full playfield Mylar that would protect a majority of the playfield, including the high wear area around light inserts. 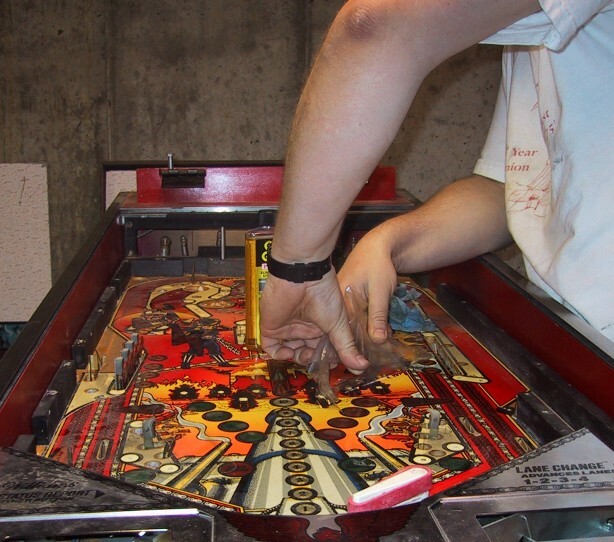 Williams started supplying full playfield Mylar with its games in the later 80s, but still it was up to the operator to apply the Mylar. Games like High Speed would chew up an unprotected playfield in a few short years. Later Williams games, such as Black Knight 2000, came direct from the factory with Mylar applied. Starting in the early 1990s, manufacturers switched from using Mylar to protect playfields to what is generally termed "Diamond Plate". This is a clear polyurethane (similar to what is used as a clear coat on cars and pre-finished wood floors) that is sprayed on after the playfield has been painted. 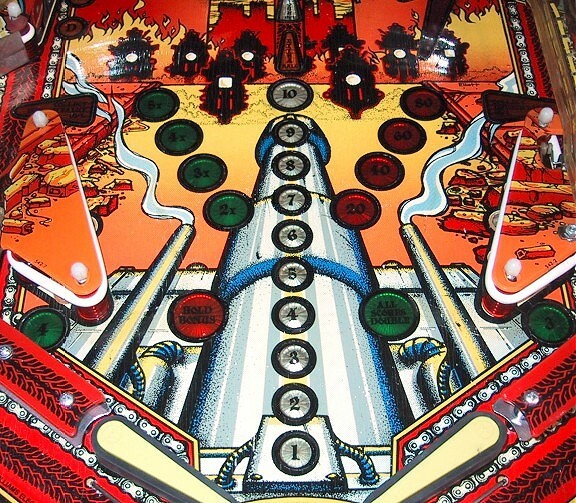 Diamond Plating has numerous advantages over Mylar, the main one being that it protects the entire playfield and you can't tell that its there. Mylar that was applied by operators after receiving the game is much more prone to bubbling then factory applied Mylar. It was usually not applied in ideal conditions or onto a clean playfield surface. Operators tended to apply Mylar after wear problems started to appear. 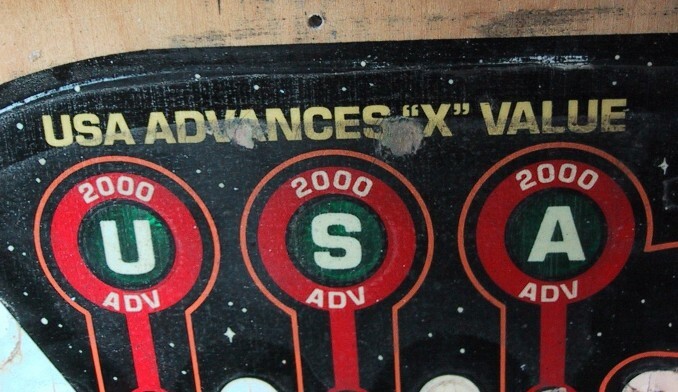 Notice in the photo below that the playfield has been worn down to bear wood under where the Mylar has been applied. The operator of this Space Shuttle tried to minimize their losses by applying Mylar after pronounced wear spots began to appear. 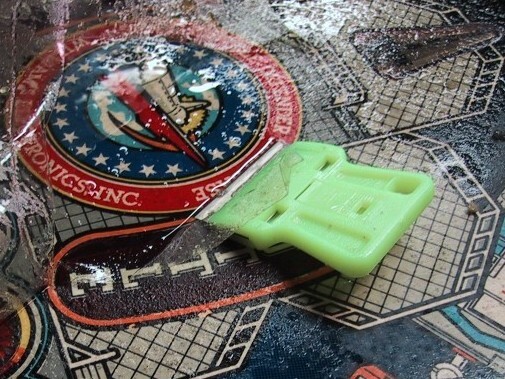 In the above photo on the left of the Space Shuttle playfield, there were three layers of Mylar. The semi-circle of Mylar was actually two layers deep! Imagine my surprise when I removed the semi-circle, only to be faced with another. - Go to an Arts and Craft store and buy a bottle of "Acrylic Gloss Medium". It usually comes in a 12 ounce bottle. You'll have enough gloss medium to fix about 1000 machines! - Use a sharp needle a put a small hole in the bubble. - Put a drop or two of Gloss Medium over the hole. It should be drawn into the bubble. Use a small blunt object to force the medium throughout the bubble. - It will dry clear and your bubble should now be invisible. 2. How comfortable are you are completely stripping and reassembling your playfield? You will need to take everything off the top of the playfield to get the Mylar and the leftover glue off your playfield. If you're not comfortable doing this, then don't attempt removing the Mylar. 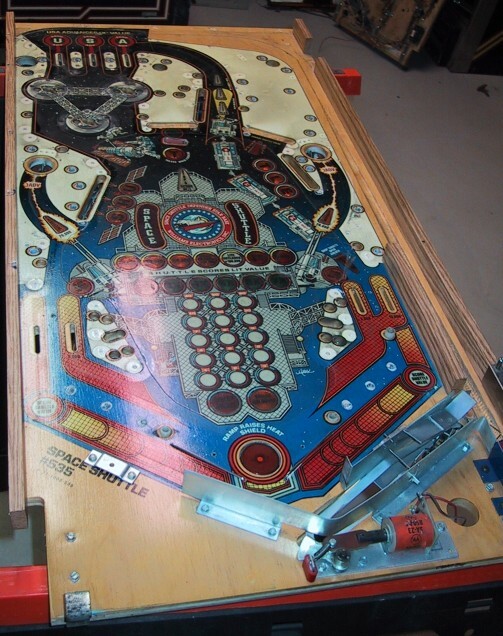 Attempting to remove the Mylar with parts still on the playfield is asking for trouble. 3. When was the Mylar applied? If the Mylar on your playfield was factory applied, I would recommend leaving it in place. 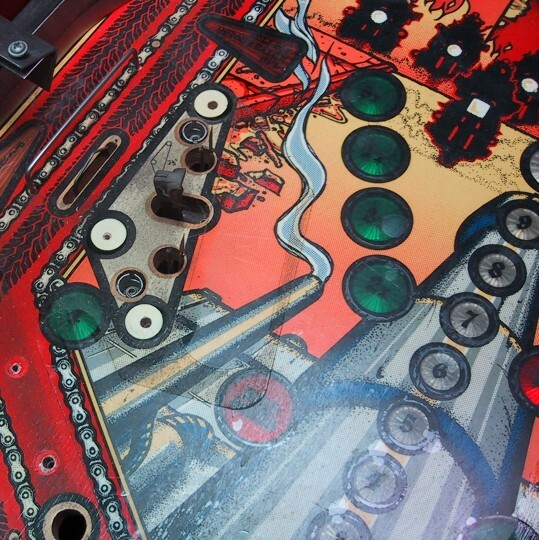 When the Mylar was applied at the factory, the playfield paint had not completely cured, so when you attempt to remove it, a good deal of the paint will adhere to the Mylar. Lettering on playfield inserts will also be removed when attempting to remove factory installed Mylar. I have heard horror stories of Mylar removal attempts from games such as F14 and Black Knight 2000. If there is Mylar over Mylar, or wear spots under your Mylar, then you can safely make the assumption that the Mylar was operator installed after the game was on location. 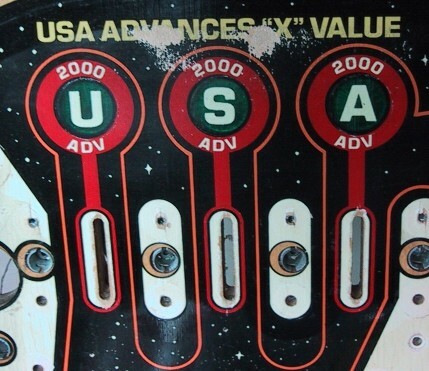 In these cases, the paint has had time to cure and will usually stay on the playfield and not come up with the Mylar. If the Mylar was put on late in the game's life, you may run the risk of pulling up paint from areas that had dried out on the playfield. This Mylar was beyond saving, so the decision was made to remove it. 4. Do you like to gamble? Removing Mylar from a playfield is a gamble. Be prepared for some touch-up work on the paint no matter what. Paint is going to come up, its just a question of how much. If you search the web or read the pinball newsgroup (rec.games.pinball), you'll read about several methods of removing Mylar. The most common mentioned method is to use a hair dryer to heat up the glue under the Mylar and then pull off the Mylar. I haven't tried this one myself, I would think you would need two people to do it the right way. I have also heard that using the heat method you need to do it all at one shot, and it the Mylar "lays" back down on itself, you're in trouble. The method I'm describing utilizes a solvent to dissolve the glued bonding the Mylar to the playfield. The advantages I find in using the solvent method are that you can do it by yourself and you can do it over a period of time. Need to quit and have dinner? No problem, you've dissolved the adhesive already so it can't stick back down again. Naptha and lighter fluid are two of the solvents mentioned a lot, however the thought of pouring lighter fluid over my playfield disturbs me. Update 1/9/02 - Don't mistake "Goof-off" for "Goo-Gone"! I've talked to a fellow who used "Goof-off" on his High Speed playfield and took off most of the paint! "Goof-off" is a paint remover that is mentioned in some of the on-line pinball how-to guides, but only for the cabinet to remove old Latex paint!! I used "Goof-off" once on an apron to remove a stubborn operator's decal, and it took the paint along with the decal. 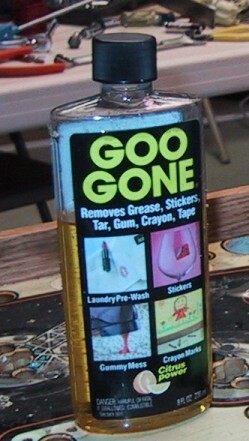 The solvent I use is called "Goo-Gone". It is petroleum based, but has a citrus smell to it (they claim it contains some sort of citrus oil). It is marketed as a glue residue remover, and that's exactly what we're looking for. I haven't heard of anyone blowing themselves up with Goo-Gone to date. You can buy it just about anywhere. Its carried by Home Depot, Lowes, Wal-Mart, etc. It comes in various sizes. I like the 8oz bottle (shown at left). It has a "squeeze" type top that you can use to direct the flow. It comes in handy in squirting it under the Mylar as you're removing it. Buy two bottles (16 ounces total) for your project. 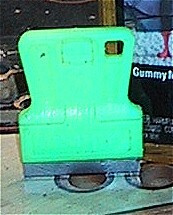 You'll use up one bottle just getting the Mylar off the playfield and another cleaning up the remaining glue residue. Another tool I recommend you pick up is a small razor knife. You can use a single edge razor blade, but this little knife gadget holds the blade at a great angle that makes it almost impossible to scratch or gouge your playfield. If found this one at the register at Home Depot. It costs about a buck. The last tool you'll need is plenty of towels! 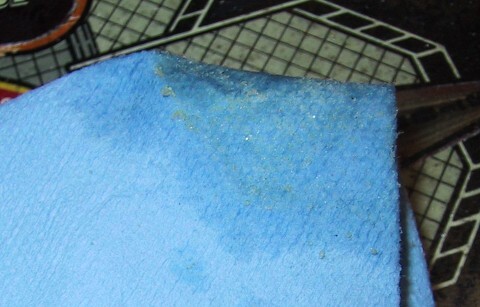 I use the blue shop towels for most of the glue removal, then finish up with some white cloth towels. Don't use kitchen paper towels, they'll fall apart. This is why you're here! Plan on about 2 hours to get the Mylar off the playfield, and then about another 2 to 4 hours to clean up the left over glue mess. You can stop anywhere in the process and pick-up later, there is nothing time sensitive about the removal process. Pick a good starting point. I like to start on one the side edges, where I can reach easily. Some folks like to start at the top, but its a good reach over the playfield on most games. Squirt Goo-Gone around the seem of Mylar on the edge you're starting on. 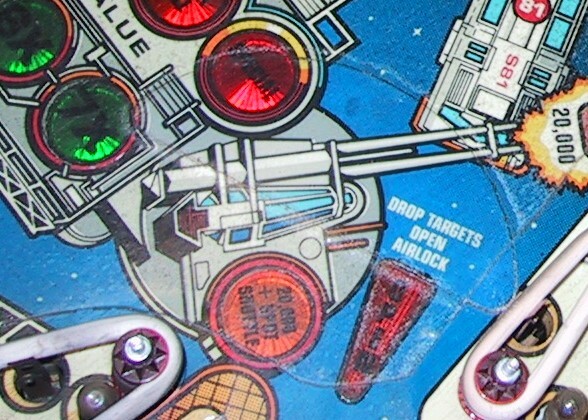 Depending on how well the Mylar is still adhering to the playfield, you may see the Goo-Gone get sucked under the Mylar via capillary action. This is a good sign! Soak the Mylar with the Goo-Gone, remember, the more Goo-Gone you use the better. Using your razor blade, carefully work it under the edge of the Mylar. Make sure you keep the angle as close to parallel to the playfield as possible. You want to get the blade under the Mylar just far enough so you can get a grip on it with your fingers. Keep squirting Goo-Gone into the area you're working on. When you get enough Mylar loose that you can grab it, just start pulling VERY SLOWLY! Stop every 1/8" or so and squirt more Goo-Gone under the seam. If you're lucky, the Mylar will pull off as one sheet. This hasn't happened to me yet! It will most likely tear and you'll need to start over from the point of the tear. It will look real ugly during the process. You won't believe how messy you're playfield will look! This is the glue residue that will hopefully stay on the Mylar, but most likely will stay on the playfield. It all comes off with enough elbow grease. I want to keep stressing that you continue to squirt Goo-Gone into the seam as you go. It might seem like its coming off fine without it, but you run the risk of pulling up paint. Once you get all of the Mylar off its time to get rid of the glue residue. Start squirting Goo-Gone on a small area of the playfield and using the shop towels start rubbing the glue off. Make sure you rotate the area of the towel your rubbing with so that your never rubbing glue with glue. Change towels often. You'll probably go through an entire roll of shop towels getting the glue off. Inserts are more difficult, but the glue will come off! Don't use a razor blade during this part of the removal process. You'll just wind up scratching your playfield. Once you think you've gotten all of the glue off in an area, squirt more Goo-Gone over the area and this time use a clean white towel. Check the towel and make sure there is no glue residue on the towel. Then move onto the next area. In the photo below the yellow globs on the towel is the glue you'll be removing. Keep at it until the playfield is completely clear of glue. Compare this photo with the one earlier that contained three layers of Mylar. There has been a little lifting of red around the special insert. 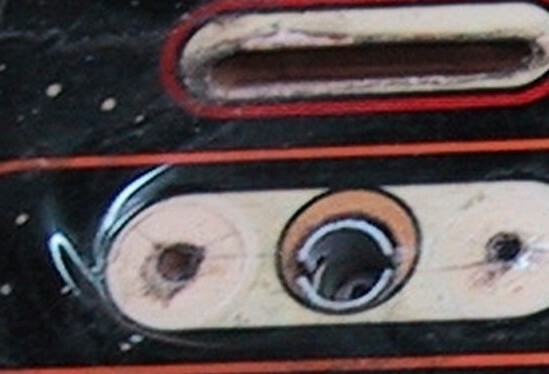 The white around the edge of the arrow insert is where it is higher than the playfield surface. This will be painted black. Once the Mylar has been taken off and all of the glue residue removed, I clean the playfield off with a clean white towel and some Naptha. While the Goo-Gone does a great job of glue residue removal, It leaves the surface a bit greasy. Wiping the playfield down with Naptha removes any left over Goo-Gone and leaves the playfield surface ready for touching up. I won't get into a discussion on playfield touch-up here, its in great detail at other sites. This is the time however when you'll want to fix up all of the area where the paint was pulled up during the removal process. If there was wear present before the Mylar went down you'll want to repair those areas like they should have been originally. Once you've finished your touch-up what should you do with your playfield? You've probably read a lot about "clear coating" your playfield at other sites, however unless you have an absolutely dust-free environment to do it in, forget it. Every polyurethaned a piece of furniture at home? Never turns the way you want it, dust seems to cling everywhere. The same will happen to your playfield unless you have the proper finishing area. There are several resources who will clear coat your playfield. These are professionals who have the right equipment and space. They charge about $150. If you want to go this route, I suggest tracking one of them down. If your game is for home use only, there is no reason to clear coat it. Three to five coats of a good Carnauba car wax will shine up the playfield and protect it for years to come. Here is a shot of the Road Kings playfield after the game was waxed and reassembled. Big difference! 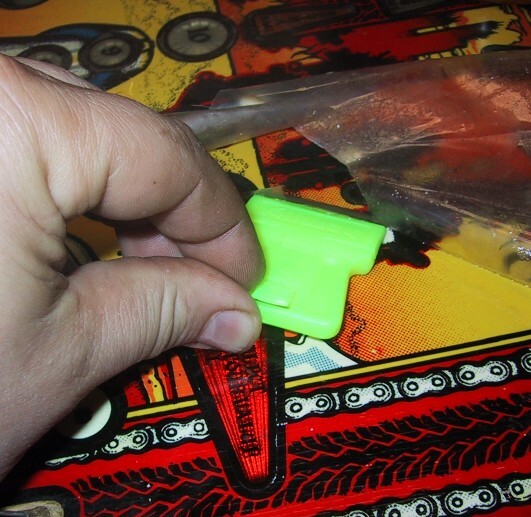 Mylar removal is a great way to breathe some life back into a tired 1980s playfield. Its something that can be done by almost any hobbyist at home with just a few tools. Word of caution again, paint lifting can occur! Take your time and use plenty of solvent to loosen the glue. The faster you go the more you risk the lifting of paint.